1. I knitted for much of the morning and early afternoon and didn’t even finish the yoke. With 10 more rows to go, I might be able to make it past the yoke before midnight, but this sweater is proving to be a formidable foe. 2. My wrist and arm are making noises at me, which is why I took a portion of the day off from knitting. A formidable foe indeed. 3. I like this yarn, but, unlike more heavily processed yarns, it definitely has a strong sheepy odor. This is not necessarily a bad thing, just not something I’m used to. Yet. 4. I haven’t even made a dent in the first yarn cake. It’s like a bottomless yarn cake. 5. I’m really surprised this yarn gets away with being called a bulky weight. It’s a heavy worsted at best. 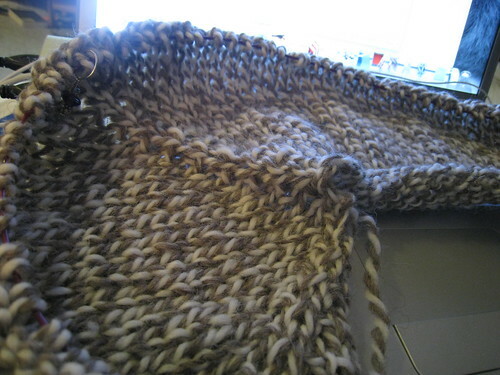 Still, I like how it’s knitting up. I love marled yarns. 6. It’s impossible to get a decent picture in my living room at night, but I tried.